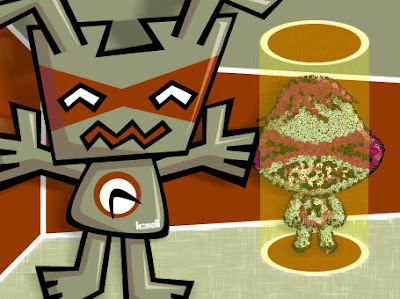 KawaiiPunk - Kawaii Mascot Blog: Transporter Turmoil! Robot Mascot! Wow! Absolutely amazing! It seems the Robot Mascot has decided to build himself a transportation device! And, even more amazingly, has managed to talk one of his fellow mascots into volunteering to try it out! Rather him than me :) But wait! It looks like the transporter is malfunctioning! What a catastrophe! But wait again! It looks like the Robot Mascot can fix it! The question is… can you work out which mascot Robot is trying to transport in his new device? The answer, as ever, will be revealed in this month’s monthly round-up!